We are very excited to offer our clients the most revolutionary color technology in twenty years – Matrix Colorinsider. It means the end of alkaline agents – that smelly, awful ammonia! Matrix Colorinsider is oil-based, odorless, gentle on the skin and very conditioning. The breakthrough color injection ods2 technology injects color inside the hair strand with 100% more efficiency resulting in maximum color impact and outstanding hair protection. 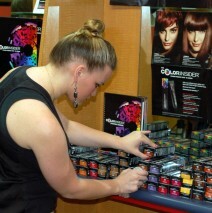 Unlike traditional permanent haircolors which are water-based, COLORINSIDER is oil-based. This oil-rich system optimizes the efficiency of the hair color process by facilitating the delivery of active ingredients concentrated in the hair fiber, optimizing their effect. This leads to 100% more efficient color delivery, with supreme respect of the hair fiber during color injection. The cream base of COLORINSIDER spreads easily through the hair yet stays precisely where it is placed. Hair color appears perfectly polished, with rich color results from scalp to ends. Give us a call for a color consultation, so we can tell you more about how Matrix Colorinsider can update your look while conditioning your hair! Minimum stress on the cuticle surface means outstanding hair protection. The Color Injection Oil Delivery System propels color actives directly to the hair’s core.